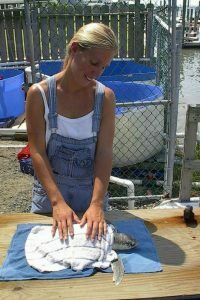 Jen Civelli, has spent years taking care of our oceanic resources. Jen had been a professor of chemistry at Cape Fear Community College, located in Wilmington, North Carolina and also taught several classes in the University of North Carolina Wilmington’s Chemistry department. Jen’s passion for the ocean started while working on her undergraduate Bachelor’s degree in Biochemistry at California Polytechnic State University in San Luis Obispo, California. Jen followed her passion for Marine Science to graduate school in San Diego, where she received her Master’s degree in Chemistry from San Diego State University. Jen loves to travel and has visited Puerto Rico, Antigua, St Lucia, St Thomas, St John, St Martin, Barbados, Los Cabos, Mexico and the Bahamas. She also loves to visit Hawaii, where she always has a blast surfing the long, fun waves of the South Shore. She taught at the college level for fourteen years. Her extra time is spent enjoying the ocean and the beauty it brings.She loves living in North Carolina because of the warm, crystal clear water that makes surfing that much more fun. Jen’s favorite thing to do is pack up the Toyota, 4-wheel out on Carolina Beach and find her own private surf break! By getting married to the founder of WB Surf Camp in May of 2004, she is assured a lifelong adventure in environmental conservation, surf travel and marine biology exploration. A chance encounter with a nesting sea turtle prompted Jean Beasley’s daughter, Karen, to found a project to protect the sea turtles, their nests and the emerging hatchlings on Topsail Island. After Karen’s untimely death, Jean took up the reins of her work. Although neither had envisioned a sea turtle hospital, when a seriously injured turtle washed up on Topsail Island something had to be done. Before they knew it, the small group of volunteers was in the sea turtle rehab business and the Sea Turtle Hospital was born. Approximately 20 fully recovered sea turtles from the size of a dinner plate to the size of a dinner table are released back to the ocean each year thanks to their efforts. The Karen Beasley Sea Turtle Rescue and Rehabilitation Center could not function successfully without its dedicated volunteers and donations from its supporters. At the hospital, the volunteers have made significant contributions to the field of sea turtle medicine but perhaps more importantly, they have listened to the message the sea turtles brought to them. The degradation of their habitat and the reasons behind their illnesses and injuries were hard to ignore. Jean began to speak of conservation and its importance, not only for sea turtles, but for the very survival of the planet itself. Now, recognized around the world for her conservation work, Jean continues to challenge all with her message that every person can make a difference and that together we can change the world!